Nintendo's Iwata Asks series has provided us with plenty of fascinating insights into the creation of the company's games, the minds of its creators and the creative spirit that defines its output. 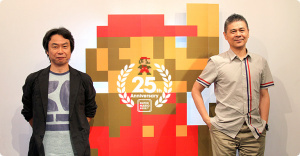 To celebrate the 25th anniversary of Super Mario Bros., Nintendo legends Shigesato Itoi (creator of the EarthBound games) and Shigeru Miyamoto sat down to speak about how they both create original, engaging games, what Miyamoto talks about at swimming lessons and how Itoi lies to his mother-in-law. The whole interview is twelve pages long and although it's a little light on genuine details of how Super Mario Bros. was actually created, it does give some insight into the creative process that has driven the series for the past quarter of a century, in particular how Miyamoto likes to take things easy. Looking back, what's been easy about making the Mario games is that they could naturally change along with the progress of technology. For example, when you make live action SFX movies and as special effects technology advances, then you have new methods at your disposal. In the same way, as technology advances, the Mario games change, too. On the contrary, books have basically always been made the same way. If it had been necessary to keep making Mario games in the same way like that, we couldn't have done it. In that way, making the Mario games has been easy. There you go: making some of the world's most enjoyable video games is easy. You just need to be Shigeru Miyamoto first. Two of the greatest geniuses in gaming ever in the same room together!? I've gotta read that interview. I hope/wish it mentions a little about a possible port of the mother series to the DS at some point! Let me save you wading through twelve pages - Mother doesn't even get mentioned, nor do any future projects other than Miyamoto working on some audio guides. Yeah, it's not exactly the best interview. But oh well, there's always part 2, maybe that one will be more interesting! I thought the interview was genius. You just can't be going into it expecting some juicy tidbit of unknown information on an upcoming title or something. Take it for what it is: Developer to developer speaking about how Miyamoto has approached creating video games. @James: Twelve pages with Itoi in the room and Mother doesn't even get MENTIONED?!? In an interview about video game making. This is madness! @Yadoking: We DO have access to the whole interview...it's linked at the end of the article right behind "Source:"
hmm, the first page is about finding the answer to where you get your ideas... that's intriguing and funny. I guess it was a little too much to expect anything out of this interview. However, I do know that Itoi does interviewing for a living, and always asks questions no one else does. Every day on Itoi's site he does interviews like this to different people, with funny and interesting stories (from what I hear, I can't read it very well). I like how these Iwata asks interviews are always soooo extremely polite to each other all the time. You never see the people disagreeing with each other, and are always extremely happy with one another. Its almost sickening but their mannerisms are to be expected I guess in a professional setting. The two Shigy's are at it! Just imagine the two of them creating a game together!!! Maybe if we blackmail Reggie, we can get him to localize Mother. Only problem is no one has any dirt on Reggie.